AMHERST, Mass. 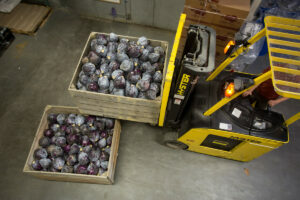 – University of Massachusetts Amherst food scientists have mapped and characterized microbial populations at Real Pickles’ facility and report that its microbiome was distinct between production and fermentation areas and that the raw vegetables themselves – cabbages destined for sauerkraut – were the main source of fermentation-related microbes in production areas rather than handling or other environmental sources. Writing in Applied and Environmental Microbiology, scientists in Dr. David Sela’s lab at UMass Amherst, in collaboration with scientists from two units of the U.S. Food and Drug Administration’s Center for Food Safety and Applied Nutrition, say this study helps to resolve the question of how microbes are transferred within a food fermentation production facility. Real Pickles is a worker-owned cooperative in Greenfield, Mass. and makes pickles, sauerkraut, and other fermented vegetables the old-fashioned way, by natural fermentation and without starter cultures or inoculants. Nutritional microbiologist Sela notes that very little is known about the microbiomes of these facilities. Fermented foods are increasingly popular internationally, he adds, because of their enhanced nutritional properties, cultural history and flavor, so the new information from this study should be of interest to food scientists, microbiologists and manufacturers around the world. The scientists used a state-of-the-art genomics approach to identify microbial species present instead of culturing the microbes. This allowed the team to quickly identify more microbes than conventional methods, to estimate their relative numbers, predict their function and determine the flow of microbes into and within the facility. “There is so much still to learn about fermented foods, nutrition, and the human gut microbiome – we are excited to be a part of the science exploring these important questions,” says Rosenberg. This work was funded in part by the Center for Produce Safety, and undergraduate fellowships from the American Society for Microbiology, the UMass Amherst Commonwealth Honors College and the UMass Amherst Center for Agriculture, Food, and the Environment.